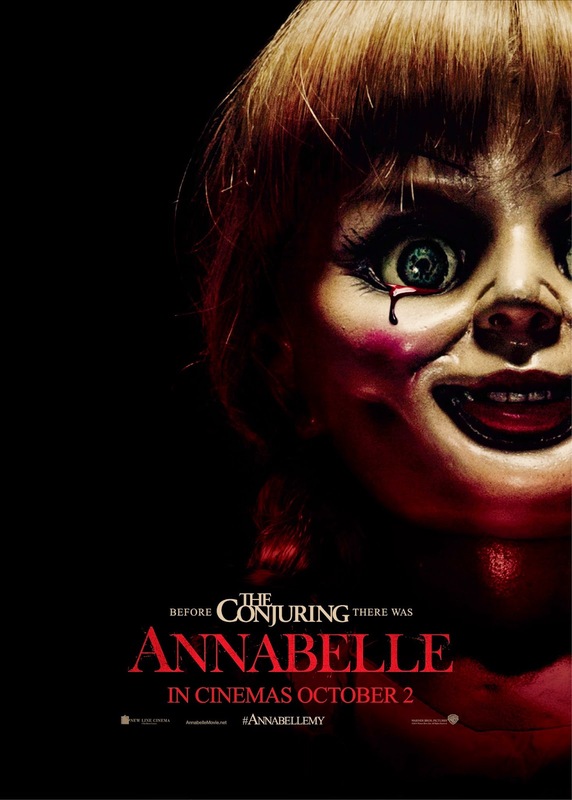 Directed by John R. Leonetti, the guy who did the horrifyingly terrible movie sequel for both Mortal Kombat and Butterfly Effect, Annabelle is a spinoff based on a small part in James Wan’s 2013 award-winning supernatural horror film The Conjuring. Though the titular haunted doll actually do exist at the Warren Occult Museum, the entire story in this movie was farted out from the crack of Gary Dauberman, a screenwriter that I’m sure not many heard of. The film has a very impatient and hence unintriguing opening, from then onwards I knew I was going to sit through 95 minutes of nothing much. So here’s the story; John Gordon (Ward Horton) brings home the rare vintage porcelain doll as a gift for his pregnant Mia (Annabelle Wallis) and soon after that, two violent members of a satanic cult, one of them named Annabelle Higgins, intruded the Gordons’ home and got themselves killed when the police came. The entity attached to the doll begins terrorising the couple and their baby, even after they tried to get rid of the doll and moving to a new place. Family, houses, a priest who tries to help, a library for research, a kind and loving husband, and a satanic entity playing around doing typical ghost stuffs instead of going straight to business. The plot and structure are unfortunately unengaging and predictably uninspiring (if you’ve watched enough horror movies, you’d be able to easily guess the story’s either going this way or the other), practically just another supernatural horror flick with the haunted doll instead of a house, with a discount version of James Wan’s Insidious films. 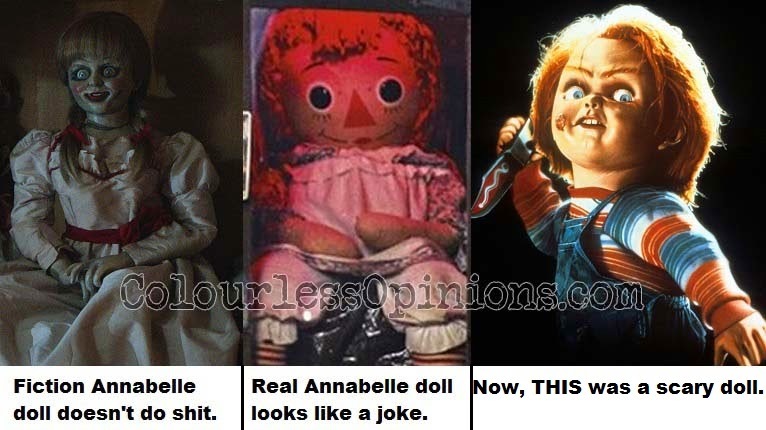 Annabelle doll does look darn creepy, but that’s all it has. If you’ve seen The Conjuring, you’d know that it doesn’t move on its own like Chucky. Here, it’s just carried around by an attached entity(s). While the film has two or three good teases and scares, there isn’t a single moment that gets under my skin like how James Wan’s films did. The camera work and use of sound and music here are actually quite decent but definitely inferior to James Wan’s works. And of course, none of the actors’ performance here would win any award, the cheesy development of the cliched characters bore more than engaging emotionally. Now let’s bring up some of the unexplained things in the movie that annoyed me. SPOILER ALERT: Skip this paragraph if you haven’t seen it and still wish to do so. First thing’s first, must it be a doll? In this case where the doll doesn’t actually do anything, could the satanic cult members have possessed or conjured the demon into some other object instead? Say, a toilet seat? That would be funny. 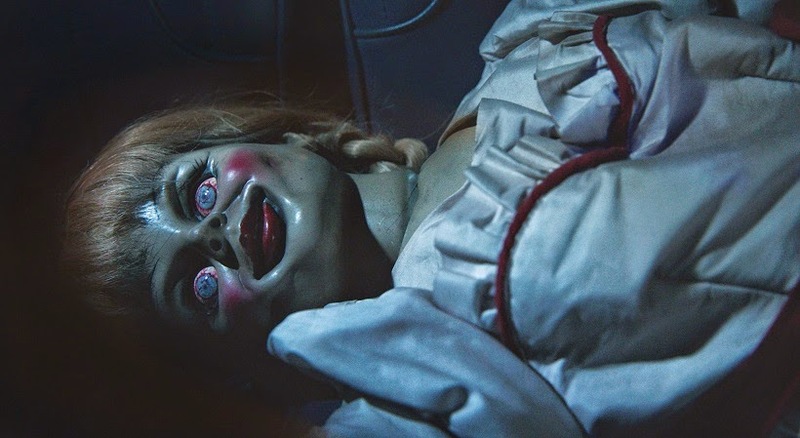 Actually even after watching the movie, I’m still not sure if the doll was possessed by Annabelle or a demon ’cause this evil entity takes different forms including a priest that’s not even dead. I was also confused with the name – is the doll also named Annabelle or just the cult member who died conjuring the demon into the doll? If she didn’t possess the doll and the doll doesn’t actually have a name, then wouldn’t that make the doll nameless actually? By the way, the main actress’ first name is Annabelle as well, ha-ha. Does this haunting entity actually need to carry the doll around to do its paranormal activities (pun intended)? The demon speaks English and can easily touch anything with power, so why doesn’t it try to threaten to kill the baby from the very beginning to achieve his goal of forcing Mia to offer her soul? And why don’t Mia and John just burn and destroy the doll? In the end, it was a nice lady named Evelyn (Alfre Woodard) from their new neighbourhood who sacrificed her own soul for this family. She’d be going to hell for eternity instead finally reuniting with her late daughter, guess she didn’t think that through, huh? I liked how the demon actually win at the end, but how the heck does the couple explain about Evelyn’s death? No, “come one, it’s a movie” isn’t a good excuse to cover up all the above. However, in overall, what more could we ask for from a director known to be bad and a practically unknown screenwriter with a production budget of US$5 million? Yes, there were classics that were made with a much lesser budget, but to be very fair, Annabelle could still be quite a terrifying Halloween kickoff, especially for those younger ones who’re new to the genre. Censorship in Malaysia: There were some very noticeable chops for the media screening at TGV 1 Utama but I’m guessing they were just graphic images of dead bodies. We can’t see dead bodies but we can have all that violence in 300: Rise of an Empire. P13 vs. 18, huh? Second opinion(s): My girlfriend didn’t have the guts to watch it, but I heard some comments in the toilet right after the screening and none of them were positive. Two guys were saying that it’s not scary at all while the others said the storyline’s too familiar. Verdict: A haunted doll instead of a haunted house, that’s the only thing unique about it.